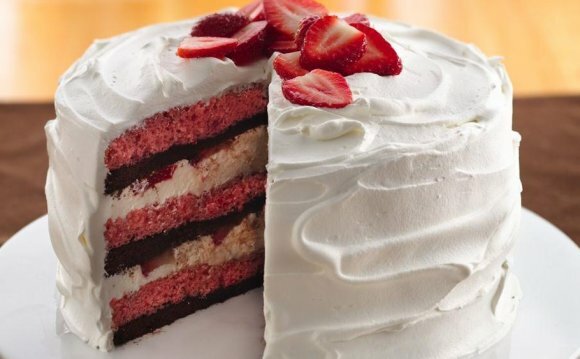 A simple yet perfect strawberry cream cake made of layers of vanilla sponge cake, soft whipped cream, and fresh strawberries. I can’t believe it’s already been a YEAR since I started this blog! Ok, maybe not a year exactly. I know I missed the actual date, but I guess that’s because it’s so hard to believe just how fast the time has gone by. When I started posting recipes, it was mostly for fun without thinking much about what it would lead to. Soon, though, I realized that this blog is one of the best things to ever happen to me. I fell in love with baking all over again on a whole new level, along with photography, and you, my sweet readers. You make everything better. I mean it. I can have a bad day, then read your comments or emails and feel better in an instant. This blog is my space where I can talk about myself, my memories, and my ordinary-yet-sometimes-thrilling life. I can bake whatever I like and then eat all of it by myself. This is what actually happens most of the time. I can spend countless amounts of time on Pinterest and Instagram. After all, it is related to my work, so that’s ok, right? I guess what I’m trying to say is: Happy birthday to my baby blog! To celebrate our first year together, I decided to make a cake from my childhood. For a fancy but still easy-to-make sweet, my mom usually makes a strawberry cake role. I’ve taken this amazing recipe and turned it into a simple layer cake for everyone to enjoy. The cake has 3 components: tender vanilla sponge cake, stable whipped cream, and fresh strawberries. Not much can go wrong here, really. This sponge cake is also known as a hot milk cake. While some sponge cakes require separating the eggs, this one doesn’t. Similar to other sponge cakes, this one requires to beat the eggs, which is what gives it its volume. Although light and tender, this hot milk cake is sturdy enough to support the heavy strawberry filling without cracking or collapsing. When I first made a hot milk cake, I thought it tasted unbelievable, and now I actually prefer it over butter cake for making layers. Since the whipped cream is very delicate, I like to add cream cheese or mascarpone cheese to the heavy cream in order to stabilize it. That way it won’t collapse once the cake is layered on top of it. Using powdered sugar rather than granulated sugar will also help in stabilizing it. Last but not least are the fresh strawberries. Depending on their size, I like to cut them in half and quarters, while leaving some whole to decorate the top layer.